Animage (アニメージュ, Animēju) is a Japanese anime and entertainment magazine which Tokuma Shoten began publishing in July 1978. Hayao Miyazaki's internationally renowned manga, Nausicaä of the Valley of the Wind, was serialized in Animage from 1982 through 1994. Other titles serialized in Animage include Ocean Waves (1990–1995), a novel by Saeko Himuro, which was later made into a television movie by the same title. 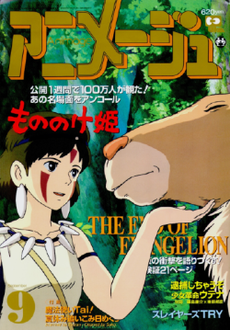 September 1997 cover, featuring the artwork of the Studio Ghibli film, Princess Mononoke. Animage was established in 1978 as the first magazine devoted to animation and comics aimed at a general public and not professionals. In 2007 the magazine started its online edition. The Anime Grand Prix is the annual prize decided by the readers' votes to the anime of the year. The Anime Grand Prix started in 1979, and the first prize was announced at the issue 1980 January, generally announced at the next year's June issue every year. It's the Animage's Anime Grand Prix Magazine Reader's Choice too. Cover of an issue of Voice Animage. 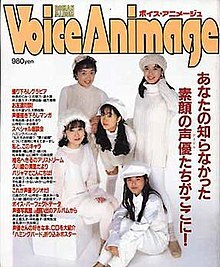 Voice Animage (ボイスアニメージュ, Boisu Animēju) is a sister magazine launched in 1994 that covers the voice acting industry in Japan. It was published irregularly at first, then settled into a regular release every other month. The magazine was edited by Hideaki Kobayashi [ja] together with Takashi Watanabe before Kobayashi moved to work on various Kadokawa Shoten magazines, and the magazine suspended publication in February 2002 with its 42nd issue. At Kadokawa, Kobayashi and Watanabe helped launch Voice Newtype. Beginning in February 2009, Voice Animage resumed publication as a quarterly magazine. The magazine has focused mainly on male voice actors since relaunching. AniRadi also began publishing VoiceRadimage (ボイスラジメージュ, Boisu Radimēju) as a play on the name of Voice Animage. ^ "2009 Japanese Anime/Game Magazine Circulation Numbers". Anime News Network. January 19, 2010. Archived from the original on January 22, 2010. Retrieved January 19, 2010. ^ "Animage January 2017". Otakumode. Archived from the original on 2018-10-10. Retrieved February 1, 2017. ^ "Official Animage Magazine Website Opens in Japan". Anime News Network. June 8, 2007. Archived from the original on 2015-09-12. Retrieved July 25, 2015. ^ "Anime Grandprix". Archived from the original on 2013-10-03. Retrieved 2013-09-25. ^ "じゅじゅの編集奮闘記 第28回 魅惑のボイスにくびったけ" [Juju Editorial Struggles Journal #28 - Head Over Heels with Captivating Voices] (in Japanese). Animage Official Site. Archived from the original on September 17, 2010. Retrieved September 25, 2009. Patten, Fred (2004). Watching Anime, Reading Manga: 25 Years of Essays and Reviews. Stone Bridge Press. ISBN 1880656922.